Twenty years ago, the landmark US Supreme Court Decision of Olmstead v. L.C., declared that unjustified segregation of people with disabilities is against the Americans with Disabilities Act (ADA). With the fierce leadership of Lois Curtis & Elaine Wilson, Olmstead paved the way for people with disabilities to have greater access to community integration, independence, and community living. Help the Disability Action Coalition carry out the legacy of Olmstead by supporting advocates with disabilities to travel and mobilize for this year’s Disability & Aging Capitol Action Day. FOR THE 20TH ANNIVERSARY OF OLMSTEAD & Share widely! 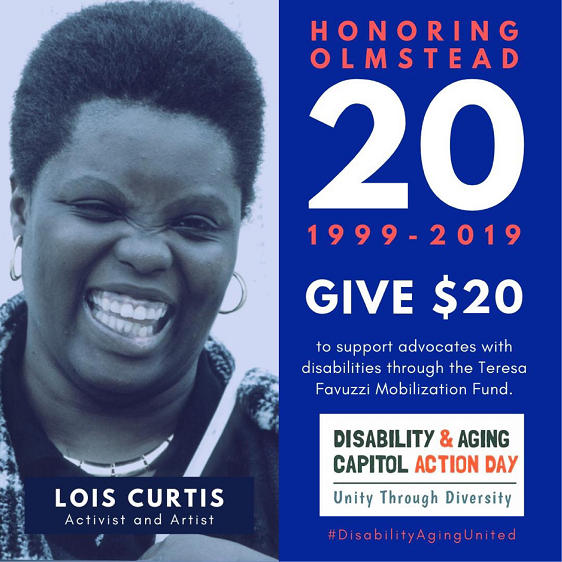 The Teresa Favuzzi Mobilization Fund also honors the legacy of Teresa Favuzzi, an Olmstead advocate and one of the founders of Disability Action Coalition and Disability Capitol Action Day. The fund covers travel costs for people with disabilities to participate, mobilize and show our collective power at our State Capitol. For more information about this year’s program and events please visit the Disability Action Coalition website at www.DisabilityActionCoalition.org. Aging services providers can learn more details about this important and historic change in a fact sheet from Justice in Aging. The five-page fact sheet helps providers understand the details of the change in order to better support their clients. The fact sheet also includes information on CalFresh rules that will be particularly relevant for enrolling SSI seniors and people with disabilities this summer and beyond. More info on CalFresh expansion in English and Spanish. Are you or someone you know living with disabilities? Are you or someone you know living with chronic illnesses? Are you or someone you know living with a pre-existing condition? Access to daily living support, such as bathing, dressing, eating, grocery shopping, medications, wound care, paying bills, transportation, etc. Access to assistive technology, such as durable medical equipment, a cpap machine, text-to-voice technology, and more. If you do not qualify for Medi-Cal and are unable to afford out of pocket services. Do you resonate with any of these situations? Do you believe that there must be more options available for long term supports and services (LTSS)? We can only help to pave the way for more LTSS options through listening and honoring our stories - the stories of people with disabilities, of all ages! 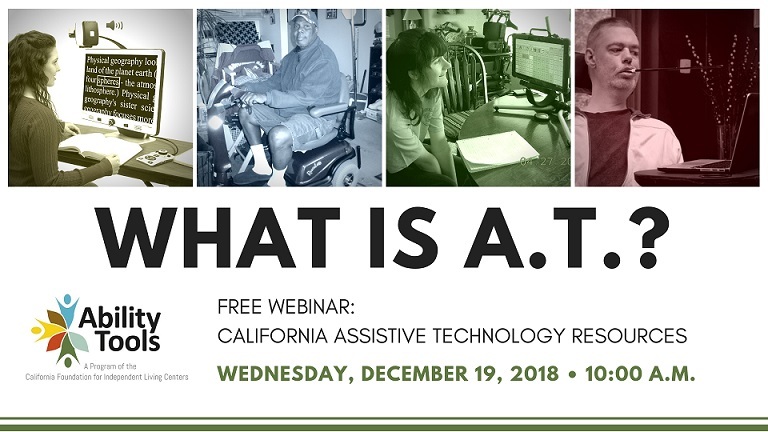 Join an effort led by older adults, people with disabilities and homecare workers that seeks to create more options for Californians to live with dignity and access in their homes and communities. The California Aging and Disability Alliance is working to find a sustainable funding source to create a new program to help Californians pay for long-term supports and services (LTSS)/Long-term Care (LTC) as well as create hundreds of great homecare jobs. This program is being designed to support those seniors and people with disabilities who fall outside of IHSS, Regional Center and other public LTSS programs, and struggle to afford the supports they need to remain in their homes. If you have a story to share and want to get involved in this work, we’d love to hear from you! Please email allie@cfilc.org or text/voice-call at (916) 606 5300. 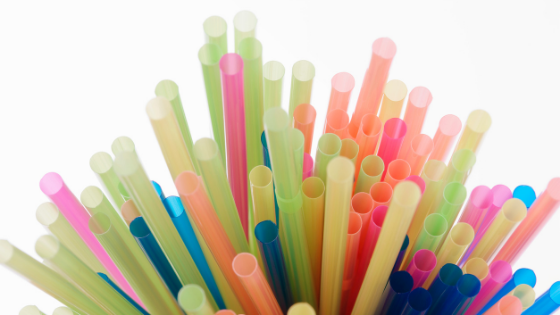 (SACRAMENTO, CALIF.) – With support from Monterey Bay Aquarium and Central Coast Center for Independent Living, The California Foundation for Independent Living Centers (CFILC)’s program, the Disability Organizing (DO) Network conducted the nation’s first study on the Disability community’s experiences with alternative straws, especially non-plastic straws. Local advocates conducted user experience tests across the state and discovered that people with disabilities who need straws for eating and/or drinking have nuanced and diverse needs. The study found that best alternatives for people with disabilities are (1) bendable, compostable plastic straws and (2) BPA-free bendable straws– both types need to be at least 8.25 inches long. “Having access to straws (historically plastic straws) allows people with disabilities can access independence, community integration and public life,” said Allie Cannington, Statewide Community Organizer at CFILC. Although people with disabilities seek straws that are flexible, lightweight, durable for re-use and different temperatures, they want to find ways to reduce waste and conserve the environment. The Disability Organizing (DO) Network mobilizes California’s Disability community and allies to change systems for greater access, independence and equity for people with disabilities locally, statewide and nationally. The DOnetwork advances this work through community organizing, advocacy, education, leadership development and coalition building. The DOnetwork is a project of the California Foundation for Independent Living Centers, funded by the Department of rehabilitation and the State Independent Living Council’s State Plan for Independent Living. The Disability Organizing (DO) Network is proud to partner with National ADAPT and National Council on Independent Living (NCIL) for #FreedomDay2019, a celebration of the reintroduction of the Disability Integration Act (DIA) into the 116th Congress on January 15, 2019 at 12PM PST. 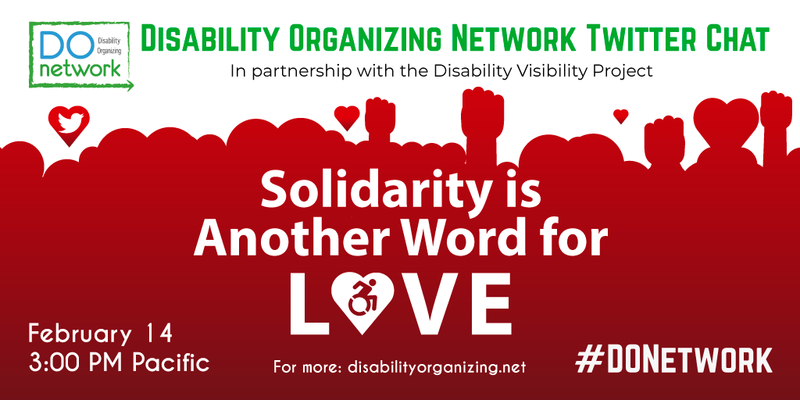 The Disability Organizing (DO) Network will be supporting local Disability groups to host their own Facebook watch parties and in person gatherings across California. If you are a California-based local independent living center, peer-run group, or a crew of Disabled friends and allies who want to educate one another and the wider community about the Disability Integration Act (DIA), there are many ways to get involved! Learn more about how you and/or your organization can host a watch party or in person gathering by joining the Disability Organizing (DO) Network #FreedomDay2019 call on Thursday, January 10 from 3-4PM PST. The call will be captioned. Need help or have questions? Please contact the Disability Organizing (DO) Network, Statewide Community Organizer – Allie Cannington at allie@cfilc.org or text/call 916.606.5300! CalABLE Goes Live December 18, 2018! CalABLE is a savings and investment plan offered by the state of California to individuals with disabilities. The CalABLE Program will officially launch on December 18, 2018. As of that date, CalABLE’s enrollment website at www.CalABLE.ca.gov will be accepting new enrollees. Instructions on how to enroll will also be easily located on the website. ​It’s been nearly a week since news outlets began reporting on the devastating tragedy of a disabled student who lost his life while at school in El Dorado Hills, California. Restraining a human being, a student, to the point of death or for any reason is unacceptable. We, the California Foundation for Independent Living Centers (CFILC), are deeply saddened and dismayed to learn about the death of Max Benson, a student with autism from Guiding Hands School on November 28. The information circulating about the incident reminds us that our advocacy to end restraints and seclusion needs to be prioritized. I believe that one of the pervasive functions of ableism, the oppression against people with disabilities, is that is isolates us from each other. International Day of People with Disabilities is a reminder that we are not alone and that we are connected; connected beyond bars, borders and oceans. International Day of People with Disabilities is a reminder that we, Disabled people, are everywhere - on every continent, in every city, remote town and village – our people have and will continue to exist, persist and resist injustice. International Day of People with Disabilities is a call to action that we, people with disabilities, can reach out, connect, and grow stronger together. 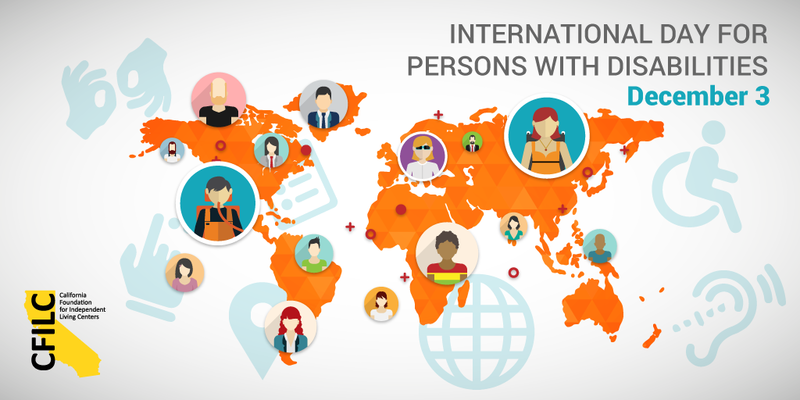 International Day of People with Disabilities is a honoring of the global independent living and disability rights movement. The first official independent living center may have started in Berkeley, but there are now independent living centers across the world - from the Philippines, Malaysia, Myanmar, Thailand, Pakistan, Nepal, Cambodia, Taiwan, Mongolia, Korea, Japan, South Africa, the United Kingdom, Germany, Finland, Sweden, Norway, Canada, Mexico, Brazil, just to name a few. Every disabled person, local disability community and independent living center has endless wisdom to share with one another. One billion strong, we are here. Personal Note: Thank you to all individuals who connected me to the larger global independent living and disability rights movements. I have learned some of my deepest lessons of disability rights, love and justice through connecting with disability activists beyond the US – from Syria, Australia and to Japan. This is not a complete list but I thank – Yoshiko and Justin Dart, Judy Heumann, Masami, Tommy, Japan Independent Living Center, Satio, Stella Young, The National Council on Independent Living (NCIL), YO! Disabled & Proud, Victor Pineda and all those who journeyed with me. The California Foundation for Independent Living Centers (CFILC) is excited to announce that Allie Cannington has joined our staff as the Statewide Community Organizer. 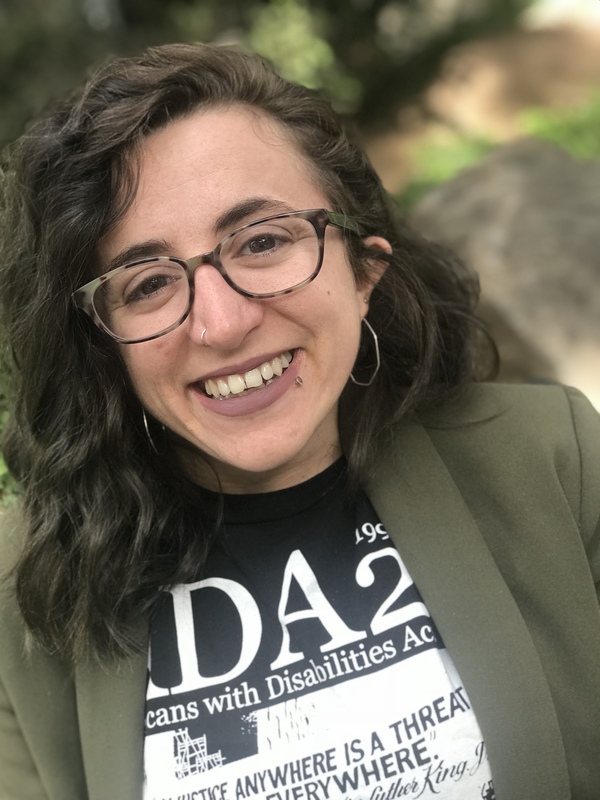 Allie will be running the Disability Organizing (DO) Network program and will facilitate calls to action for the California Disability Communities and allies, through community organizing, advocacy, education, leadership development and coalition building to effect systems change in local, state and national issues. Learn more about her in the CFILC Staff Page. Thank you for your important contributions to humanity every day! Justin was a long time disability/human rights advocate. He and I fought for the passage of the Americans with Disabilities Act, ADA, fought for health care for all Americans including those with preexisting conditions, and supported mental health parity, integrated employment and inclusive education and many more. Today I need your help to get your friends, family, and other people you know to vote in this election. Turnout will determine who will win this election. The disability community must focus our energy on turning out voters throughout the USA by millions. We must vote for candidates that support disability/human rights and services. Shall we do it, or remain as an ignored, powerless minority? We are indeed a magnificent majority! Colleagues, you/we have the power! Let us use it! Now is the time. If we don’t, we have nobody else to blame, but ourselves. Join me at the polls to vote on November 6th! Justin and I love you! Together we have overcome. Together we shall overcome. We believe in you! Help us spread the word:Use the sample social media posts below to help us spread the word about the importance of voting today. "VOTE as if your life depends on it - because it does!" Post with Justin Dart quote graphic, available here. Tired of others making decisions for you? Tired of attacks on the Americans with Disabilities Act (ADA)? CMS will be hosting a national call on Wednesday, November 7, 2018 from 1-3pm ET to solicit stakeholder feedback on Electronic Visit Verification (EVV) implementation. This opportunity is in keeping with the Sense of Congress language in H.R. 6042, indicating that CMS should “convene at least one public meeting in 2018 for the purpose of soliciting ongoing feedback from Medicaid stakeholders on guidance issued May 16, 2018 regarding electronic visit verification”. During the call, CMS will address information submitted in advance through the previously established EVV mailbox (EVV@cms.hhs.gov) and will provide an opportunity for individuals to offer additional feedback at that time as well. As such, CMS encourages stakeholders to submit feedback to EVV@cms.hhs.gov by October 26, 2018. *Please include “November 7 Stakeholder Call Feedback” in the subject line of the email. Please see https://www.medicaid.gov/medicaid/hcbs/guidance/electronic-visit-verification/index.html for a number of resources, including the statutory language requiring EVV usage, and implementation materials issued by CMS to-date based on that statute. We look forward to hearing from you! *Please note – In an effort to reach as many stakeholders as possible, a transcript and audio recording will be posted to the Podcast and Transcripts website at https://www.cms.gov/Outreach-and-Education/Outreach/OpenDoorForums/PodcastAndTranscripts.html for downloading. There will also be two business days of the Encore presentation for those who were unable to join the call. The DOnetwork is partnering with the REV UP Campaign and respected electoral campaign professionals to bring you engaging webinars on voting during this 2018 midterm election season. Check out these webinars below and CLICK HERE to register in advance. Celinda Lake, President of Lake Research Partners, will be sharing findings around voters with disabilities and seniors as an important segment of the electorate. It is clear that in this political moment it is vital to engage every demographic and understanding their voting patterns is necessary to do this well. People with disabilities and seniors must be well represented in the U.S. political system in order to have a representative democracy. Seniors and people with disabilities are beginning to engage in patterns of voting more Democratically in recent years and it is important to know how to engage their politics and discuss which issues are important to them. Her talk will focus on publicly available polling, as well as her own insight into these demographics – including the generic congressional ballot, President Trump’s job approval, and voting in the 2018 election. Celinda Lake is a prominent pollster and political strategist for progressives. She currently serves as President of Lake Research Partners. Lake’s polling and strategic advice has helped candidates such as Jon Tester, Senator Debbie Stabenow, and Governor Bob Wise defeat incumbent Republicans and her expertise guided Senator Mark Begich to victory, making him the first Senate candidate in Alaska to oust the incumbent in 50 years. She has focused on women candidates and women's concerns, having worked for Speaker Pelosi, Governor Janet Napolitano, Senator Debbie Stabenow, Senator Barbara Mikulski, Mayor Carolyn Goodman, Mayor Annise Parker, and over a dozen women to the House and Senate . Celinda worked for the largest independent expenditure to take back the House and has been a key player in campaigns launched by progressive groups such as the AFL-CIO, SEIU, Sierra Club, Planned Parenthood, Vote Vets, HRC, and EMILY's List. Lake co-authored the book What Women Really Want with Republican pollster Kellyanne Conway, which examines the way women are changing the political landscape in America, and she also served as pollster for Senator Joe Biden's 2008 presidential bid. She worked with innovative message projects that helped redefine language on the economy, inequality, big money in politics, climate change, public schools, teachers, and criminal justice reform. Join this collaborative webinar hosted by the DOnetwork and the REV UP Campaign to learn more about barriers to accessing election information, including information on candidates and the issues. CLICK HERE to register today! Join this collaborative webinar hosted by the DOnetwork and the REV UP Campaign to learn more about registering to vote and related accessibility barriers. The webinar will explore how to conduct accessibility voter registration drives, voter ID laws, and common accessibility barriers that people with disabilities may encounter during the registration process. Webinar presenters include the League of Women Voters, VoteRiders, and Disability Rights California. 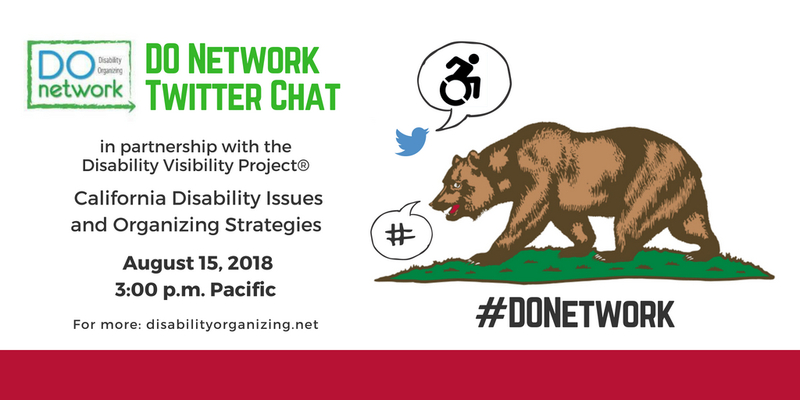 Reminder, the Disability Organizing (DO) Network and the Disability Visibility Project® are hosting a series of Twitter chats for Californians with disabilities about civic participation, community organizing, and disability rights. Join us for our first Twitter chat about current disability issues on Wednesday, August 15, 2018, 3-4 pm Pacific. At the time of the chat, click on the 'Latest' tab for the hashtag #DOnetwork. This will show you the questions and everyone's responses in real time. Check @DisVisibility's account every 5-6 minutes for the next question. Since when is a little discrimination with some segregation OK under the law in America? How do you feel about some of your fellow Americans making pennies on the dollar for their work? Does American-made using underpaid workers seem patriotic? Some of our citizens are making far less than a minimum wage and it’s perfectly legal in America today — until we say, “no more.”It happens more than most realize due to an archaic provision in the Fair Labor Standards Act called 14(c), which recently turned 80 years old. Since 1938, 14(c) permits employers to obtain a certificate from the U.S. Department of Labor and pay people with disabilities in their workforce less than the minimum wage. This continues for years, if not decades, and sometimes, in working conditions not subject to Occupational and Health Safety administration regulations — because they’re supposedly “training programs” and not actually jobs (though these employers often fulfill business contracts based on labor these Americans provide). Today approximately 164,000 Americans with disabilities receive sub-minimum wages. During the almost two decades I have worked to see an end to 14(c), I’ve become increasingly convinced that we need to invest into people and not just sustain broken programs. I have visited many locations across America where 14(c) is utilized, and as a former assistant Secretary of Labor under President George W. Bush, I got an even closer look at its effect on people's lives. While we often talk about 14(c) by the number of years it has been in place, I tend to think of it in terms of the lives that have been wasted, potential that has been lost, and the hopes and dreams of individuals that were never realized — all because of low expectations of others. Defenders of this provision argue that workers with disabilities are not as productive and need assistance learning job skills to become more competitive in a “normal” job down the road. But its operation is far less altruistic than it may sound. Not only do egregious abuses occasionally come to light — such as people being paid in gift cards or food rather than money, but there are also more common outcomes that should churn every American’s stomach. Truly, in a political environment with demand for results, it is amazing that such a program persists. Without aggressive lobbying, this program would be only a memory of ineffectiveness and failure to yield a return on investment. Nonprofit service providers holding 14(c) certificates, receiving Medicaid funds for training people for work should never be more than a stepping stone to competitive integrated employment. Yet, in a 2001 Government Accountability Office (GAO) report, only five percent of people ever left these supposed training grounds. That’s a 95-percent failure rate in mission! What’s more, compared to alternative models with records of success, research shows 14(c) training placements yield higher costs over time per person and notably, lower wages; whereas individuals who utilized supported employment services as an alternative to 14(c) had lower costs over time per person and higher wages. Those statistics don’t leave much room to argue the continuation of 14(c) based on results. Letting this provision persist is a 100-percent failure rate of national policy, given our nation’s progress and goals for people with disabilities. We can no longer afford an economy that leaves an entire group of people unemployed or underutilized. And I would have to believe this broken program is abhorrent to this administration that is fighting to get Americans real work. In 1938, there were no federally protected civil rights for people with disabilities, nor even a right to a public education. However, since that time, society and people with disabilities have come to expect far more out of their lives than past public policies allowed. And employment should be no exception. The continuation of 14(c) says that people with disabilities are a black hole for society — that they’re not capable of doing much, that they don’t warrant investment, and that they aren’t going anywhere. A self-advocate with Down syndrome who has spoken poignantly against 14(c) said that the “sub-minimum” in “sub-minimum wages” communicates “subhuman” to people, and who wants to be thought of as subhuman? Although I have little patience for well-paid lobbyists defending the continued practice of paying people with disabilities pennies an hour, I have great compassion for the families who have loved ones with disabilities affected by 14(c) and are scared at what changes may entail for them. These families made choices I believe they sincerely thought were best at the time, and they should never be vilified. They should take heart seeing what is possible with a better policy. A small handful of states and a larger number of individual providers have begun making changes away from the 14(c) work model to alternative models with records of success. Melwood, one of the largest employers of people with disabilities on the East Coast, used to be one of the many nonprofits using the 14(c) model. 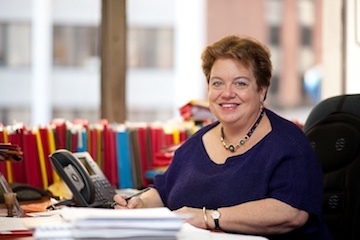 During a leadership change at Melwood in 2013, new President and CEO, Cari DeSantis, recognized the incompatibility of 14(c) with the organization’s vision of full inclusion of people with disabilities. Following a three-year transition celebrated by its employees and their families, Melwood completely relinquished its 14(c) certificate in 2016, noting that the financial cost of discontinuing the discriminatory practice was not only manageable, but was also a prudent investment in its mission. Today, Melwood’s financial position is the strongest it has ever been and it is employing more people with disabilities than ever before. Many of the fully-transitioned providers like Melwood — and families who have experienced the changes — are excited to help others do the same and have marveled at the blossoming of talent and effort of people with disabilities who are finally helped to explore their strengths and interests (rather than be relegated to piece work whether they like it or not) and transition to real jobs — just like the 14(c) program intended but has largely failed to deliver. So long as it remains legal to pay people with disabilities less than the minimum wage, little pressure exists to invest in alternate models. If paying our fellow Americans with disabilities pennies an hour under the auspices of “training” (that seemingly never ends) continues, our federal policy message to them will remain that despite the passage of civil rights laws, despite the advancements in the education of people with disabilities, and despite our national march towards equality for all human beings, people with disabilities will never be viewed as inherently equal and deserving of life, liberty, and the pursuit of happiness. It’s far past time to do better than that. It’s time to phase out 14(c) of the FLSA. Happy 28th Birthday for the ADA!